Tafraoute, nestled in the valley of Ameln south of Morocco, is a charming and quiet Berber village famous for its almond and argan oil, which offers tourists a huge range of colors and flavors. 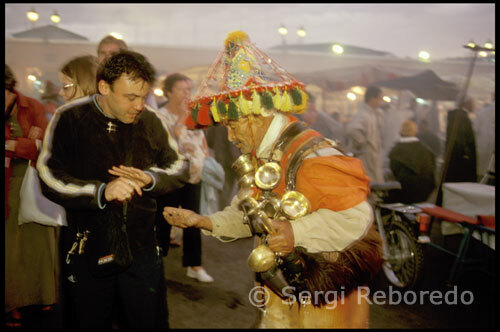 By Sergi Reboredo (text and photos). The city of Tafraoute, located in a basin surrounded by rock formations and cliffs of pink tones, is the perfect starting point for exploring the nearby towns berebers. The road leading to the coastal town of Agadir, without going too far, is dotted with many Berber villages, some of which remain almost uninhabited. At first the inhabitants of the region had subsisted on agricultural activities like growing almond, argan, palm trees, wheat and barley, but the limited benefit they brought many people to emigrate in search of a better future. Today the picture is somewhat more encouraging since tourism has increased considerably making the local economy begins to recover slowly. 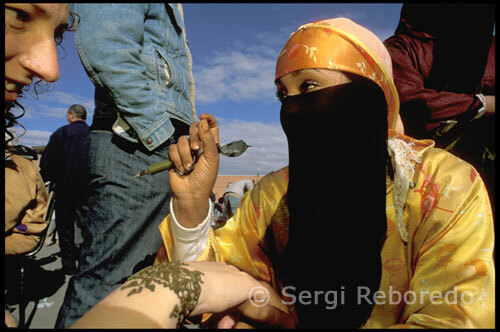 The Berbers make up 40% of the population of Morocco. Their language is Berber, a branch of the Afro-Asiatic language family and comprises 300 dialects closely related. This is mainly a spoken language since it is rarely used to write. Typical Berber constructions built with mud bricks and flat roofs have changed little over the centuries. The homes, located in the Atlas Mountains, rising to a height of three or four plants depending on the number of people making up the family. These buildings, despite its fragile appearance, have stood for many centuries, having gone through hardships of all kinds, epidemics, famine, enemy attacks ... During these periods some families abandoned villages to take refuge in the mountains and reoccupy their homes in more lenient times. Painted Rocks, art and nature. A few miles from Tafraoute in Grasp-Oudad, is a famous rocky area for its painted in blue and red rocks. These stones are not as colorful work of nature, but the Belgian artist Jean Veran. They painted in 1984, are still nowadays cause of devotion among tourists who come to contemplate, but over time has caused the deterioration of the paint as well as the loss of color saturation. It was not the first experience in this type of landscape art as Veran had done similar work in the Sinai Desert in Egypt. Firstly, selected the rocks by its smooth, rounded surface, and then spray paint them in contrasting indigo and scarlet tones. In the center of the village are several shops run by berebers and filled many souvenirs, antiques, art, clothing and all a wide range of handmade objects. One of these stores is La Maison Touareg, which is near the souk, and it can find plenty of rugs for every budget. The market of the city center is the best place to buy typical leather slippers. No typically cost 60 dirhams, and their colors are yellow and red pair men for women. In stores Souk women gather in the morning to sell their goods, among which olive oil and Argan, spices, clothing, fruits, vegetables and cheeses. The quiet town of Tafraoute is located about 80 kilometers inland from the Atlantic coast to the west of Morocco. Located behind the fascinating valley of Ameln, bordered to the northeast with the Anti Atlas, north and west by the National Park Sous-Massa. The main bus companies are based on Sharia al-Jeish al-Malaki. Among his most important destinations include: Casablanca (14 hours), Rabat (16 hours), Tiznit (3 hours), Agadir (5 hours) and Marrakech (10 hours). Two local buses leave to Tiznit at 4:00 and 7:00. Morocco has a fast and economical system buses connecting major cities as well as an airline, Air Maroc, which offers domestic flights between major cities. The railway only covers the northern part of the country. To enter Morocco A valid passport with a validity of six months is required. The City of Tafraoute has a warm and mild climate almost all year round and can be very hot in summer, where thermometers sometimes reach 40 ° C. This situation usually occurs when the wind blows from the Sahara, called sirocco or chergui. Typically the environment temperatures are maintained at 20-30 ° C, even in winter. The rains are characterized by being present in the months of November to January, but usually minor. These rains tend to be brief so the sun is guaranteed almost every day of the year. The official currency is the Dirham (Dr) which in turn is divided into centimes. There are coins of 1, 2, 5, and 10 dirhams and 10, 20, and 50 cents. The ticket higher value is 200 dirhams. One euro equals 10.84 Dr. is possible to change money at banks and exchange houses. You can also pay in hotels or withdraw money with credit cards Visa and Mastercard. It is advisable to wear garments of linen and cotton, comfortable and breathable shoes for sightseeing and wear something more formal if you think about going out at night. Essential suntan lotion and a hat to protect from the sun. The diverse cuisine is served. A variety of Moroccan meals that reflect the rich cultural heritage. Many of these dishes are of Berber influence. The most popular Moroccan dishes are couscous, tagine (stew of meat and vegetables) and harira (spicy lentil soup), and can be enjoyed in the most luxurious restaurants and in homes of any Moroccan. The main meal is lunch and menus are often written in French and Arabic. MOROCCAN KITCHEN, THE BEST AMONG THE ARAB WORLD. Moroccan cuisine, dominated by a range of flavors to wisely combine many species, is the influence of diverse cultures throughout centuries have marked this unique, refined and tasty touch that allows it to be among one of the best cuisines in the world Arabic. Is the result of Arabic influences and especially Berber, although to a lesser extent other cultures as the Jewish and Christian have also put their two cents. These Mediterranean, Oriental and African combinations make Moroccan cuisine is a delight for the palate, creating typically oriental dishes with a Mediterranean touch. The Moors were the ones who introduced Hispanic foods like olives, olive oil, nuts, fruits and aromatic herbs; and the Arabs who brought all the spices of the area now occupied by Indonesia. Both in street stalls and in the most prestigious restaurants seen at first sight a world of sensations, harmony and flavor dominating a wide range of colors that decorate the presentation of the dishes. Fresh and aromatic are a delight to both the eye and the palate. Moroccan cuisine is known for being very spicy and constantly mixing sweet and savory flavors seasoned by a wise dose of spices. His copious and refined dishes are prepared from numerous quality ingredients including meat, fresh fish, vegetables, legumes, and nuts are. Salads are also an important part in Moroccan cuisine. They are varied and individually served on small plates separately or as a companion to stews and meats. They are usually made up of fresh vegetables grilled or stewed. Tasty and traditional Moroccan dishes. One of the most popular dishes in the world when it comes to Morocco is the "couscous", of Berber origin. Its base, delicious semolina, can be combined with meat, raisins, vegetables and a wide assortment of spices. The traditional style is served in a big bowl of eating several people taking him straight to his mouth with his right hand without using any cover. The harira is another gastronomic delights of the country. It is a thick, comforting and nutritious soup made from meat, chickpeas, lentils, onion, tomato, celery and spices. A serving time is often accompanied by dates and during the month of Ramadan and the coldest months of the year works as a restorative body thanks to its high calorie intake. The tagine is a dish that enjoys wide acceptance. It consists of beef stew that is often accompanied by fruit and vegetables and the preparation varies depending on different regions. Thus, we can find the tagines of chicken with preserved lemon and olives, tajine beef with prunes and sesame, and other more daring bittersweet, without forgetting the lamb tagine of fish processed simmered in its own source of clay called tayinera. Chicken is one of the protagonists of many of the exquisite Moroccan dishes. In most stalls cooked curry served with a side of rice or couscous, but is also present in other dishes like the Shan, a kind of bittersweet Andalusian origin pie stuffed with chicken, egg almonds and cinnamon. Is also typical "mechoui" a whole lamb roast and whose preparation belongs exclusively to men, and the skewers or kebabs served at street stalls and markets. Today the use of species is an essential and characteristic element of Moroccan cuisine. The most commonly used spices in Morocco is the black pepper, which is used in many dishes, but we can not forget the saffron, cinnamon, ginger, sesame, cumin, cardamom, anise, parsley and cilantro. Cumin is the queen of spices in Morocco. It is used mainly in meat and its characteristic aroma pervades every street stalls where "brochette" roast. It is a very old and flavoring ingredient, which is also used in India and can find or whole good or powder but once ground tends to lose flavor and aroma. Moroccan cuisine also uses other ingredients like preserved lemons for the chicken dishes, orange blossom water and "harissa" a seasoning tangy flavor that is basically composed of dried red chilies, cayenne pepper oil, olive oil and garlic. Tea, all day long noted. Tea is the national drink and is present in almost every meal of the day. It made from green tea mixed with mint and sugar served at all hours of the day, both to start the day and after dinner desserts. Some people add to mint verbena, marjoram herb, aromatic geranium and orange blossom but always with a good dose of sugar. The tea is also used as a symbol of welcome and never have to reject your offer. Some refer to the tea as "Moroccan whiskey" and they say the first cup is bitter as life; the second is sweet as love and gentle third as death. The pastries, sweet as honey. The dishes of Moroccan pastries are based mainly in pastries accompanied by honey, almonds, pistachio nuts, coconut or sesame flavored with orange flower water or rose. They are inspired by ancient Eastern and Hispanic-Muslim recipes and always a deliciously appetizing dish. The "beghrir" is one of those desserts that should not be overlooked. It's crepes honeycomb and honey accompanied by melted butter. The "bstila" is a pastry with almond milk and "feggas" cupcakes with almonds and grapes.